A stage coach route created in 1815 through historic villages and sites in southwestern Ireland’s County Kerry is the destination 200 years later of 8- and 11-day self-guided hikes by native adventure travel specialist Ireland Walk Bike Hike (http://www.irelandwalkhikebike.com/). 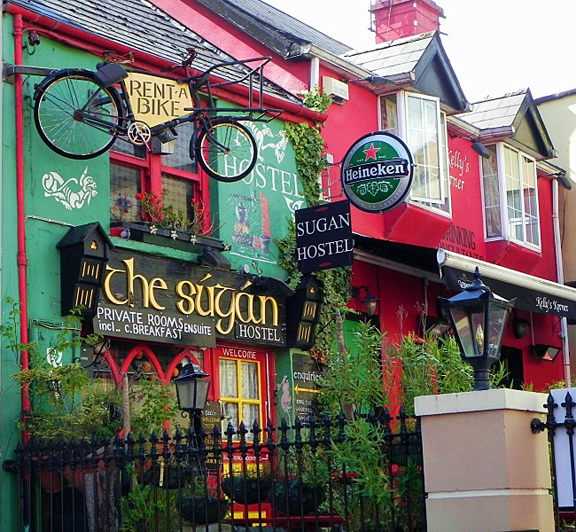 This is a self-guided, independent walking tour with guests following a pre-ordained route equipped with detailed route descriptions, maps and pre-arranged accommodations (with full Irish breakfasts) booked in advance by Ireland Walk Hike Bike. Guests have the convenience of 24-hour emergency support and telephone back up. Luggage is moved ahead of the walkers to their next destination. Depending on how many days they can devote to this hike, guests can enjoy Ring of Kerry 11-Day Self-Guided HIKE from €925 per person double or Ring of Kerry 8-Day Self-Guided HIKE from €749 per person double. Kerry’s unique character is drawn from its unequalled diversity of land and seascapes while its offshore islands add another dimension to the beauty of the coastline frequently dotted with castles, forts and watchtowers. Warm summers and mild winters produce many sub-tropical and alpine species of flora while the temperate ocean waters, heated by the Gulf Stream, produce magnificent underwater vistas with whales, dolphins, seals and even turtles being frequent visitors. The Ring of Kerry traces the coastline of the Iveragh Peninsula beginning in the Oak Woods of Killarney National Park, followed by the picture-postcard towns of Kenmare, Sneem and Glenbeigh before taking a step back in time at historic Derrynane House. Guests walk an average of 20 km a day. Access for this holiday can be from Dublin, Cork or Shannon airports with bus and/or train connections available to Killarney year round. On July 6, 1815, Charles Bianconi introduced his first horse-drawn carriage for passengers in Ireland, thus launching Ireland’s public transport system. He was able to establish regular horse-drawn carriage services from major towns and villages. Buses and coaches were commonly called “Bianconi’s” well into the 20th century. This route, which precedes railways, is a unique way to travel Ireland seeing the sites that travelers saw 200 years ago. Ireland’s fabled County Kerry consists of a series of spectacular mountainous peninsulas divided by deep sea inlets. MacGillycuddy’s Reeks form the centerpiece of the Ring of Kerry, a 179-kilometer circuit from Killarney, via Killorglin, Caherciveen, Waterville, Kenmare and back to Killarney across Moll’s Gap and past Ladies View – one of Ireland’s most famous viewpoints. Weaving between these points is a network of ancient paths that are nearly as old as the land itself, many of which form part of a long-distance track known as the Kerry Way. Here and there along the coast, pretty fishing villages, such as Caherdaniel and Portmagee, have successfully withstood the elements and offer a picturesque contrast to the verdant hills that surround them. The Skellig Islands lie 8 miles off the tip of the peninsula, two rocky peaks rising sheer out of the Atlantic Ocean. Skellig Michael is a world heritage site on account of its 6th century monastery, with beehive huts, oratories and inscribed crosses. Seabirds abound as well. Small Skellig is home to over 40,000 gannets, the second largest colony in the world. Please contact Ireland Walk Hike Bike for more information on both fully-guided and self-guided trips; Phone: USA/Canada 1 720 316 5973 1 720 316 5973; email: info@irelandwalkhikebike.com, website: http://www.irelandwalkhikebike.com.